5 The Brotherhood of Steel are an organisation dedicated to preserving pre-War technology. 10 The Brotherhood are known for their use of power armour and advanced technology, such as laser weapons. They are most interested in military technologies. 15 The Brotherhood can be heavy-handed in their self-assigned role as protectors of pre-War technology.They have been known to aggressively remove or destroy tech in the hands of other factions, especially when they feel those factions can't be trusted with it. 20 There are two distinct factions of the Brotherhood of Steel—the West Coast Brotherhood and the East Coast Brotherhood. Both factions ultimately answer to the High Elder on the West Coast. 25 The Brotherhood evolved out of remnants of the United States Military and government-affiliated scientific organisations in the wake of the Great War. They have gone to war twice: Once against the New California Republic, and once against the Enclave when they rose on the East Coast. Martial Advantage. Once per turn, the squire can deal an extra 7 (2d6) damage to a creature it hits with a weapon Attack if that creature is within 5 ft. of an ally of the squire that isn't Incapacitated. Coordinated Fire. Once per turn, the squire has advantage on a ranged weapon attack it makes if at least one of its allies has also made a ranged weapon attack against the same target since the squire's last turn. Laser Gun. Ranged weapon attack: +4 to hit, range 60/180 ft., one target. Hit: 11 (2d8 + 2) energy damage. These children are the Brotherhood's future, and their first directive is to stay safe. If the Brotherhood facility in which they are stationed comes under attack they are supposed to retreat to a safe room or, in the worst case, escape the facility. Squires do receive combat training, and in a siege situation the Brotherhood will equip their squires to defend themselves with small arms, usually with a laser pistol (included in the statblock). Older squires occasionally leave the safety of their base alongside one or more Knights to observe and learn from them in the field. They are equipped with a pistol in these circumstances as well, but again only for defense. The squire is meant to stay out of harm's way, and the Knights they are accompanying are charged to prioritise the safety of the squire. Such missions are never critical, and the Knights can always call them off if they can't see a way to proceed without putting the squire at unacceptable risk. Although technically civilians, scribes do receive combat training and are capable of looking after themselves. They need to be ready to pull their weight in the event of an attack or a field assignment. Martial Advantage. Once per turn, the initiate can deal an extra 7 (2d6) damage to a creature it hits with a weapon Attack if that creature is within 5 ft. of an ally of the initiate that isn't Incapacitated. Coordinated Fire. Once per turn, the initiate has advantage on a ranged weapon attack it makes if at least one of its allies has also made a ranged weapon attack against the same target since the initiate's last turn. Laser Rifle. Ranged weapon attack: +4 to hit, range 110/210 ft., one target. Hit: 11 (2d8 + 2) energy damage. Laser Rifle. Ranged weapon attack: +5 to hit, range 110/210 ft., one target. Hit: 12 (2d8 + 3) energy damage. Laser Rifle. Ranged weapon attack: +4 to hit, range 90/210 ft., one target. Hit: 11 (2d8 + 2) energy damage. Martial Advantage. Once per turn, the aspirant can deal an extra 7 (2d6) damage to a creature it hits with a weapon Attack if that creature is within 5 ft. of an ally of the aspirant that isn't Incapacitated. Coordinated Fire. Once per turn, the aspirant has advantage on a ranged weapon attack it makes if at least one of its allies has also made a ranged weapon attack against the same target since the aspirant's last turn. Multiattack. The aspirant makes two attacks. Martial Advantage. Once per turn, the scribe can deal an extra 7 (2d6) damage to a creature it hits with a weapon Attack if that creature is within 5 ft. of an ally of the scribe that isn't Incapacitated. Coordinated Fire. Once per turn, the scribe has advantage on a ranged weapon attack it makes if at least one of its allies has also made a ranged weapon attack against the same target since the scribe's last turn. Multiattack. The scribe makes two attacks. Laser Rifle. Ranged weapon attack: +5 to hit, range 90/210 ft., one target. Hit: 11 (2d8 + 2) energy damage. Combat Knife. Melee weapon attack: +5 to hit, reach 5 ft., one target. Hit: 5 (1d6 + 2) piercing damage. Martial Advantage. Once per turn, the lancer can deal an extra 7 (2d6) damage to a creature it hits with a weapon Attack if that creature is within 5 ft. of an ally of the lancer that isn't Incapacitated. Coordinated Fire. Once per turn, the lancer has advantage on a ranged weapon attack it makes if at least one of its allies has also made a ranged weapon attack against the same target since the lancer's last turn. Multiattack. The lancer makes two attacks. Combat Knife. Melee weapon attack: +7 to hit, reach 5 ft., one target. Hit: 6 (1d6 + 3) piercing damage. Laser Rifle. Ranged weapon attack: +8 to hit, range 90/210 ft., one target. Hit: 13 (2d8 + 4) energy damage. Combat Knife. Melee weapon attack: +8 to hit, reach 5 ft., one target. Hit: 7 (1d6 + 4) piercing damage. Multiattack. The senior scribe makes three attacks. Laser Rifle. Ranged weapon attack: +6 to hit, range 90/210 ft., one target. Hit: 11 (2d8 + 2) energy damage. Combat Knife. Melee weapon attack: +6 to hit, reach 5 ft., one target. Hit: 5 (1d6 + 2) piercing damage. Multiattack. The lancer makes three attacks. Laser Rifle. Ranged weapon attack: +9 to hit, range 90/210 ft., one target. Hit: 13 (2d8 + 4) energy damage. Combat Knife. Melee weapon attack: +9 to hit, reach 5 ft., one target. Hit: 7 (1d6 + 4) piercing damage. Martial Advantage. Once per turn, the knight can deal an extra 7 (2d6) damage to a creature it hits with a weapon Attack if that creature is within 5 ft. of an ally of the knight that isn't Incapacitated. Coordinated Fire. The knight's ranged weapon attack bonus increases by +2 for each of its allies that also made a ranged weapon attack against its target since the knight's last turn, up to a maximum of +8 (twice the initiate's Proficiency bonus). Multiattack. The knight makes two attacks. Gatling Laser. The knight can pepper a 10-foot cube area within 240 feet with shots. Each creature in the targeted area must succeed on a DC 15 Dexterity saving throw (with advantage if they are more than 80 feet from the knight) or take 17 (6d4 + 2) energy damage. Coordinated Fire. Once per turn, the knight has advantage on a ranged weapon attack it makes if at least one of its allies has also made a ranged weapon attack against the same target since the knight's last turn. Incite Action. A member of the Brotherhood of Steel who can hear the knight-sergeant and has a lower CR than them immediately takes an Action or moves up to their speed. Multiattack. The knight makes three attacks. Lead By Example. If the knight-sergeant uses Incite Action, they may make a single attack against one target. Incite Action. A member of the Brotherhood of Steel who can hear the knight-captain and has a lower CR than them immediately takes an Action or moves up to their speed. Multiattack. The knight makes four attacks. Combat Knife. Melee weapon attack: +8 to hit, reach 5 ft., one target. Hit: 6 (1d6 + 3) piercing damage. Gatling Laser. The knight can pepper a 10-foot cube area within 240 feet with shots. Each creature in the targeted area must succeed on a DC 15 Dexterity saving throw (with advantage if they are more than 80 feet from the knight) or take 18 (6d4 + 3) energy damage. Lead By Example. If the knight-captain uses Incite Action, they may make a single attack against one target. Incite Action. A member of the Brotherhood of Steel who can hear the knight -commander and has a lower CR than them immediately takes an Action or moves up to their speed. Boosted Gatling Laser. The knight can pepper a 10-foot cube area within 240 feet with shots. Each creature in the targeted area must succeed on a DC 15 Dexterity saving throw (with advantage if they are more than 80 feet from the knight) or take 25 (6d6 + 4) energy damage. Lead By Example. If the knight-commander uses Incite Action, they may make a single attack against one target. Martial Advantage. Once per turn, the paladin can deal an extra 7 (2d6) damage to a creature it hits with a weapon Attack if that creature is within 5 ft. of an ally of the paladin that isn't Incapacitated. Coordinated Fire. Once per turn, the paladin has advantage on a ranged weapon attack it makes if at least one of its allies has also made a ranged weapon attack against the same target since the paladin's last turn. Incite Action. A member of the Brotherhood of Steel who can hear the paladin and has a lower CR than them immediately takes an Action or moves up to their speed. Multiattack. The paladin makes five attacks. Beta-Tuned Boosted Gatling Laser. The paladin can pepper a 10-foot cube area within 240 feet with shots. Each creature in the targeted area must succeed on a DC 15 Dexterity saving throw (with advantage if they are more than 80 feet from the paladin) or take 25 (6d6 + 4) damage. Half of the damage dealt (rounding down) is fire damage, and the rest is energy damage. In addition, the creature is set ablaze and takes 2 (1d4) fire damage at the beginning of each of its turns. A creature can end this damage by using its action to make a DC 10 Dexterity saving throw to extinguish the flames. Lead By Example. If the paladin uses Incite Action, they may make a single attack against one target. Incite Action. A member of the Brotherhood of Steel who can hear the paladin-commander and has a lower CR than them immediately takes an Action or moves up to their speed. Multiattack. The paladin commander makes six attacks. Laser Rifle. Ranged weapon attack: +11 to hit, range 90/210 ft., one target. Hit: 13 (2d8 + 4) energy damage. Combat Knife. Melee weapon attack: +11 to hit, reach 5 ft., one target. Hit: 7 (1d6 + 4) piercing damage. Lead By Example. If the paladin-commander uses Incite Action, they may make a single attack against one target. Incite Action. 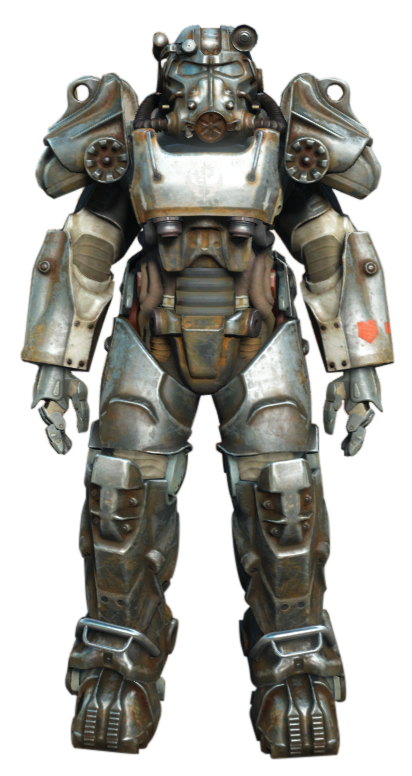 A member of the Brotherhood of Steel who can hear the star paladin and has a lower CR than them immediately takes an Action or moves up to their speed. Multiattack. The star paladin makes six attacks. Laser Rifle. Ranged weapon attack: +13 to hit, range 90/210 ft., one target. Hit: 14 (2d8 + 5) energy damage. Combat Knife. Melee weapon attack: +13 to hit, reach 5 ft., one target. Hit: 8 (1d6 + 5) piercing damage. Beta-Tuned Boosted Gatling Laser. The paladin can pepper a 10-foot cube area within 240 feet with shots. Each creature in the targeted area must succeed on a DC 15 Dexterity saving throw (with advantage if they are more than 80 feet from the paladin) or take 26 (6d6 + 5) damage. Half of the damage dealt (rounding down) is fire damage, and the rest is energy damage. In addition, the creature is set ablaze and takes 2 (1d4) fire damage at the beginning of each of its turns. A creature can end this damage by using its action to make a DC 10 Dexterity saving throw to extinguish the flames. Lead By Example. If the star paladin uses Incite Action, they may make a single attack against one target. Knights maintain the Brotherhood's weapons and armour, and act as a reserve of footsoldiers in the event of larger scale operations. Their ranks are equivalent to those of Paladins within their own domain and the overall structure of the organisation, but Paladins always have seniority over Knights when it comes to operational chain of command. Scribes are responsible for researching and recording History as well as researching, rediscovering, and maintaining technology. Paladins are responsible for the security of Brotherhood facilities as well as all operations out in the wasteland. During larger operations such as war Paladins command Knights in the field. Paladins also have seniority over scribes in the event any of the researchers are in their charge when a hostile engagement breaks out. The Brotherhood operating on the East Coast has evolved a much more granular hierarchy, giving more room for personal advancement and for establishing a clear chain of command. Knights and Paladins are now part of the same hierarchy, with Paladins as the most senior ranks of their Army. Due to the capture of a large number of vertibirds from the Enclave, the East Coast Brotherhood has also developed a separate Air Force. Meanwhile, the Scribe branch has been split into three distinct divisions known as Orders. The Army (Knights and Paladins) are the ground force of the Brotherhood, and represent the bulk of its military might. On the East Coast Knights and Paladins are part of the same hierarchy and perform the same duties: Paladins are simply the most senior officers within that hierarchy. The Air Force, known as Lancers, pilot the Brotherhood's vertibirds and airships. Although the highest rank within the Air Force is Lancer-Captain, the Lancer-Captain in charge of an airship is known as a "Lancer Captain" or simply "Captain" to avoid confusion. Airships are used to stage long-distance operations which would not be possible without them. The Captain of the vessel is generally afforded great authority, outranking all but a General or an Elder. For instance, during the Brotherhood's operations in the Commonwealth during 2287, the second-in-command to Elder Maxson, in the absence of a General, was Lancer Captain Kells, captain of the Prydwen. The Order of the Sword research and maintain weaponry. As such, this Order inherits some of the responsibilities of the Knights' original purpose within the Brotherhood. The Order of the Shield research and maintain armour and defensive technology. As such, this Order inherits some of the responsibilities of the Knights' original purpose within the Brotherhood. The Order of the Quill research and record history as well as developing and maintaining non-combat technologies. This Order is the closest to the original purpose of the Scribes as still seen on the West Coast. *Although technically lower in rank than a General, Star Paladins and Sentinels are given autonomy from the army's hierarchy and the trust to undertake their own operations without much in the way of oversight. Of course, refusing to assist when requested by senior officers or Elders has consequences, so soldiers of these ranks exercise their freedoms carefully.